Sister Brenda (Brendan) Walsh, O.P. Remembering Service at 9:30 a.m. Sister Brenda Walsh, O.P., 85, passed away at Lakeshore Manor, Racine, WI on Sunday June 10, 2018. Delia Agnes was born August 2, 1932 to James and Mary (nee: Brady) Walsh in Dangenmore, County Mayo, Ireland. On September 7, 1958 she joined the Racine Dominicans and at her reception in 1959 she was given the religious name Sister Brendan. 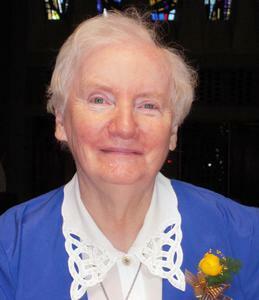 She professed her first vows in 1961 and her final vows in 1967. In 1968 she changed her name to Sister Brenda. Sister Brenda spent many years in service to others in teaching, religious education and work for the betterment of the people of Racine. She began her ministry in 1963 at Assumption Grotto, Detroit, MI. Places in Wisconsin where she served were St. Benedict, Milwaukee; St. Charles, Burlington; Holy Cross, Kaukauna; and St. Edward and St. Mary, Racine. She served as Vice President of the Racine Dominicans from 1974-1982. From 1982-2002 she served as the Director of the Senior Companion Program. Sister Brenda served also as the Director and Coordinator of Racine in the 80’s, Executive Director of Racine 2000 & Beyond and was instrumental in helping start the Healthcare Network in Racine. She was an On Call Chaplain at All Saints Hospital and was the Community Promoter of Preaching. She became a resident at Lakeshore Manor, Racine, WI in August 2014. Sister Brenda is survived by the Racine Dominican Sisters and Associates; her sister Cait (Ainri) O Flathuin and nieces and nephews. She was predeceased by her parents; her brothers Martin and Michael and sister Mary Walsh. Visitation will be in the Siena Center Chapel on Wednesday June 13 beginning at 9:00 a.m. with a Remembering Service at 9:30 a.m. followed by a Mass of Christian Burial at 10:30 a.m. Interment will take place at Holy Cross Cemetery Hwy 32. Memorials to the Racine Dominican Mission Fund have been suggested. The Racine Dominicans would like to extend their thanks to the staff that cared for Sister Brenda at Lakeshore Manor and Ascension All Saints Hospital.